There is a reason thermoelectric (coal, nuclear or natural gas) power plants are located near rivers, lakes or oceans. It is because they need tremendous quantities of water to generate power. More than 90 percent of electricity generated globally comes from thermoelectric plants. These plants boil water by burning a fossil fuel (or using a nuclear reaction) to create steam that spins turbines. Steam must be cooled back into water before it can be reused to produce more electricity. Colder and cleaner water cools steam more effectively and allows for more efficient electricity generation. Legacy coal-fired plants, relying on once-through cooling processes, need about 30,000 gallons of water for every megawatt of electricity produced, and nuclear plants need even more. Modern natural gas combined cycle (NGCC) plants can produce the same megawatt of electricity with 5 percent as much water (which is still about 1,500 gallons per megawatt). Water quality is almost as important as quantity when it comes to plant efficiency. The turbidity of incoming water can vary depending on storms or man-made interactions, so incoming plant water must be treated before it can be used. Disinfection. This is accomplished by dosing chemicals such as sodium hypochlorite (bleach), or hydrogen peroxide (at concentrations as high as 30 percent), which kills bacteria by oxidizing molecules in the cells of the germs. These harsh chemicals have been used for more than 100 years but are still prone to causing problems for pumps by off-gassing, which can entrap air in a pump and prevent it from maintaining prime. To address this issue, metering pumps must be able to pass the gas bubbles through the pump head in a manner that prevents any loss of prime due to off-gassing. pH Adjustment. Plants operate best when the pH of the water is as close to neutral (7) as possible. Specific volumes of acids are administered to alkaline feed-water (pH higher than 7) to adjust the pH, while similar volumes of caustics are dosed to acidic feed-water (pH lower than 7) to raise its alkalinity. Legionella. One of the primary goals for water treatment applications (particularly in cooling towers) is to prevent the growth of legionella, which is a ubiquitous organism that can appear in almost all sources of water. Numerous studies have found cases of legionella in up to 60 percent of all cooling towers around the globe, and the organism has shown the ability to resist standard chemical treatments. Preventing legionella is best accomplished through a combination of disinfection and pH control treatments. One halogen that works effectively is Bromine, if it can be delivered at a higher pH level (8.5 to 9). By using metering pumps to dose additional volumes of caustics to raise alkalinity, a sweet spot can be created for Bromine to effectively kill legionella. Flocculation. At the end of a plant cycle, all of the water used must be treated prior to disposal. Many plants use flocculation basins, where additional chemicals and polymers are dosed via metering pumps to aggregate precipitated particles, making them easier to filter out. Additional rounds of disinfection and pH adjustment are typically rendered by the plant’s wastewater facility before water is discharged into the environment. Image 2. 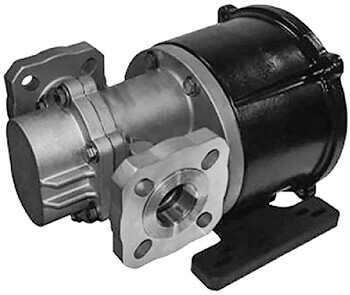 Gear pumps are available in different materials to handle a wide range of chemicals. The criteria for selecting metering pumps typically includes flow rates, pressures and corrosion resistance (depending on what chemicals are pumped). Although plant operators and the engineering, procurement and construction (EPC) firms that serve them have multiple options for pumping infrastructure, the most popular choices usually involve diaphragm or rotary gear pumps. In plants where American Petroleum Institute (API) requirements must be adhered to, diaphragm pumps are the preferred choice. Diaphragm pumps can also deliver +/- 0.5 percent accuracy, which is often required in chemical manufacturing processes or in refineries. Flexibility to accommodate flow and pressure requirements. The flow rates required for water treatment applications in power plants typically range from a few liters per hour (l/hour) to approximately 100 l/hour. Most water treatment processes are low pressure applications, ranging from less than 10 Bar, up to about 40 Bar. Gear pump lines feature numerous models that can accommodate any flow range, connection size and pressure requirements within these ranges.